Christianity and the Problem of Human Violence: Part 128: The Gerasene Demoniac - Did Jesus Kill 2000 Pigs? 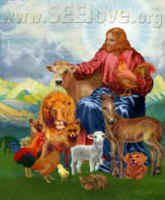 Many animal advocates have been troubled by the story, described in Mark 5:1-20, Luke 8:26-39, and Matthew 8:28-34, of the Gerasene demoniac. Jesus exorcised demons from a possessed man, and the demons then inhabited a herd of swine who, crazed, ran down a steep bank and drowned in a lake. A remarkable aspect of this story is that there is no such steep bank near Gerasa. Therefore, I think it is most reasonable to regard this story as revealing allegorical truths rather than as literal historical narrative. In other words, I do not think that Jesus actually killed 2000 pigs; the story tells truths about Jesus' healing powers, but they are not all literal truths. René Girard has argued that, according to mimetic theory, the Gerasene demoniac reveals profound insights into scapegoating.6 The possessed man was the communal scapegoat. He bore the burden of the people's unclean spirits - they could blame him for their own forbidden thoughts and desires that threatened social order and peace. In Mark's account, "Night and day among the tombs and on the mountains he was always crying out and bruising himself with stones." Normally, "possessed" people were hunted, stoned, and killed. Here, the man hid in the tombs and stoned himself, protecting himself from the scapegoat's usual fate. His howling was an affront to them, but they did not kill him. Rather than kill him, they bound him in chains that were insufficient to hold him and allowed him to bruise himself with stones without causing lethal damage. His self-expulsion from the community and self-injury satisfied the community's need for a scapegoat. Therefore, there was a balance between the insufficient chaining by the community and the insufficient self-stoning by the man. This balance allowed the scapegoat to live while serving the community's need for a scapegoat. Perhaps this unusual arrangement began when the scapegoat, recognizing that angry communal members were convinced of his possession and determined to stone him, started to stone himself. Since the "demons" were already stoning the man, the community was afraid to join the demons in stoning him. The "possessed" man naturally feared Jesus, who had said, "Come out of the man, you unclean spirit!" (Mark 5:8). Jesus threatened the balance of violence between the man and the community, which could lead to the man's death. When Jesus asked their names, the demons replied, "Legion," which means many. The demons represented all the forbidden desires of the community. They were parts of the human psyche, and consequently they could not have had individual names, which would have indicated that they existed independent of human beings. The demons begged Jesus not to send them out of the country (Mark 5:10; "abyss" in Luke 8:31). I think the "demons'" request reflected the community's concern that exorcising the demons from the community's current scapegoat would have forced the community to find a new scapegoat onto whom they could project their fears, feelings of hate, and illicit desires. Frequently, people have tried to transfer the role of the scapegoat from humans to animals. When the demons asked to be sent to the swine, this represented the community's desire to see its own demons find a new home. The story refers to swine as the recipients of the spirits, since they, as unclean animals in Jewish eyes, seemed appropriate repositories of unclean spirits. However, the crazed pigs went over a steep bank and drowned. What has happened here? According to Girardian theory, typically people have metaphorically or literally thrown those they regard as "possessed" off a cliff. However, in this story, the "possessed man" was saved, and the demons that had afflicted the community and that had been projected onto the scapegoat were destroyed. The community's response to the cured man is illuminating: "they were afraid" (Mark 5:15). Their scapegoat was cured, and consequently their peace and equanimity were threatened. Many people have argued that the people were upset about the economic loss of the pigs, but if that were the case they would have been angry, not afraid. The Gerasene people asked Jesus to depart, Jesus having done enough damage to the social order already. Meanwhile, the cured man begged to leave town with Jesus, I think because the man was at high risk of being stoned by a community desperate to reestablish order. However, Jesus refused the man's request, forcing the man to bear witness to Jesus' act of healing by destroying demons rather than by destroying people. People "marveled" at the cured man's story, indicating that destroying demons was not as socially devastating as everyone had feared. I do not think we should regard demons as individuals separate from human beings. They are our forbidden thoughts and desires that threaten to disturb communal order and peace. However, they do more than possess us individually. Because our desires are mimetic, they can become enshrined in institutions. The Holy Spirit works to cure demonic possession, but institutions can be more difficult to cure than individuals. Institutions can become false gods to which people offer blind allegiance. Consequently, words alone cannot exorcise them. One needs to demonstrate that institutional demons derive from and depend on lies. Jesus' self-sacrifice on the cross showed that "sacred" sacrifice, enshrined in religious "laws," was scandalous.